QAI was set up to create an ecosystem of education, training, accreditation and quality improvement on a global platform. We believe that this organisation would provide a platform to stakeholders including professionals and organisations, associated with quality in any way, to share their wisdom and knowledge in order to make its Vision realized. This will further provide tremendous opportunities to all concerned to learn and contribute in improving organisations engaged with QAI. Different activities would be initiated under different verticals in a manner that they remain independent of each other and any potential conflict of interest is avoided. Vision: Nurturing the largest global pool of organisations and people through quality improvement and accreditation framework. Mission: To conceive and deliver education, training, accreditation and related programs in partnership with stakeholders using an approach of co-design and co-creation. QAI Journal for Healthcare Quality and Patient Safety, a publication of Quality and Accreditation Institute Pvt. Ltd, is a peer-reviewed print + online Semiannual journal. The journal's full text is available online at http://www.QAIJ.org. The journal allows free access (Open Access) to its contents and permits authors to self-archive final accepted version of the articles on any OAI-compliant institutional / subject-based repository. The journal will cover technical and clinical studies related to health, ethical and social issues in field of Governance and leadership,Quality improvement,Accreditation/ certification,Performance monitoring,People centric care,Quality culture,Patient safety (Infection prevention & control, medication safety, patient safety solutions, diagnostic safety, WHO initiatives etc. ),Universal Health Coverage,. Articles with clinical interest and implications will be given preference. 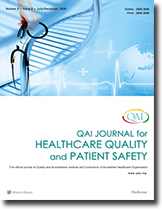 QAI Journal for Healthcare Quality and Patient Safety, a publication of Quality and Accreditation Institute Pvt. Ltd, is a peer-reviewed print + online Semiannual journal.